Would 100% recommend this hotel. Great location and staff was wonderful! Zero issues. Really friendly staff, comfortable. Very kindly made me a takeaway breakfast to have at 4am before my Salkantay Trek, and let me leave my suitcase. Perfect service all round. Such helpful and friendly staff, Luz and Erica helped us with everything we needed, thank you so much! Breakfast was good and when you have to leave early, they can also prepare you something to take with you. 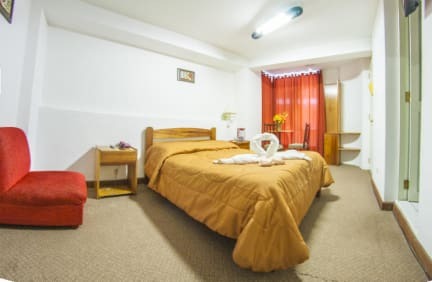 The rooms are spacious with a nice bathroom with a good hot shower. Location is really good, right next to San Pedro market, only a short walk to Plaza de Armas. Overall we had an amazing stay here and would recommend very much! I had a pleasant stay at Antares. Puppies are offically not allowed but it didn’t state online. The lady from the frontdesk made a few calls and my puppy Bob was also welcome. 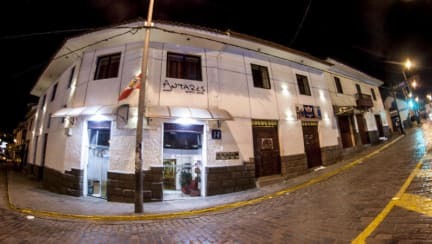 I arrived 5am in Cusco and they checked me in right away that was very nice. The location is central, because of the holidays there was a huge market in front of the hotel that I really enjoyed. On jan 1st I left early to Ollantaytambo so I couldn’t make breakfast. They prepared a lunch bag for me to bring with me.